The Tree of Many Fruits is guarded by a centaur who challenges He-Man to a fight to test his strength. He-Man has a better (i.e. less violent) idea: a tug of war. I don’t like heroes to have it too easy. I called for He-Man to strain against the pull of the centaur, lose ground, dig his heals in and then give it the extra effort you expect from a hero. Director Ernie Schmidt and the animator did a first class job and the scene plays very well. The centaur, refreshed from a dunk in the pool, gladly yields the apple to He-Man. On the way out of the maze, Zem jumps in and snatches the silver apple. He-Man disarms the wizard in the same manner as Man-At-Arms disarmed Prince Adam in the opening scene. With Brindle satisfied, He-Man and Man-At-Arms return to Darksmoke with the father and daughter. Granamyr commends Torm’s champion and sends them all outside so he can begin the Great Spell of Changing. Soon Torm will be human. 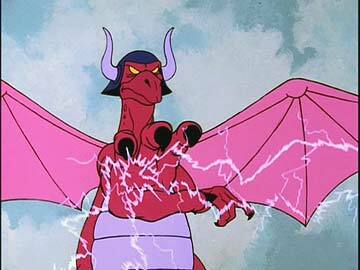 Meanwhile, Zem appears on the dark side of Eternia and awakens an ancient enemy of Granamyr – the evil dragon ShadowWing. The old dragon has no care for the puny human’s desire for revenge (nor gratitude neither) and turns Zem into a toad. ShadowWing arrives at Darksmoke and challenges Granamyr to face him. Torm who is outside with the humans, leaps to the defense. “Evil worm!” (Oppenheimers’ best Truman Capote imitation). ShadowWing magically encases Torm in stone and he drops like – wait for it – a rock. Before Brindle can muster up some magic of his own, he is turned to glass. He-Man takes off in the Wind Raider and fires on the dragon, but misses. ShadowWing spits lightning and strikes the Wind Raider. He-Man steers the damaged aircraft toward the main dome of Darksmoke and leaps out. The Wind Raider crashes into the dome which, of course, angers Granamyr. The great dragon roars out of the wreckage and flies up to meet his old enemy in the air (with much larger wings). After a few bouts of fire and lightning, the dynamic dragon duel ends with Granamyr delivering a mega-zap that sends ShadowWing to the Realm of Demons, never to return. The story ends with Granamyr presiding over the wedding of Torm (now human) and Lyra. I’m pleased that Granamyr’s wings stayed large and didn’t revert to the tiny wings in the original model. I don’t agree with pulling Man-At-Arms so close to camera. I prefer my staging in the panel on the left. 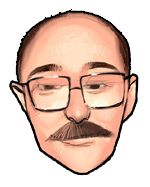 Overall, Ernie Schmidt and everyone did a first rate job on an excellent Larry DiTillio story. The icing on the cake came when the success of He-Man gave us another season to do more. “The Return of Granamyr” was significant to me in many ways. This marked my third Larry DiTillio script and it was a good one! It was my last He-Man storyboard of the season and we didn’t know how well the series would do. I finished this board in mid-July 1983 and the first episode wouldn’t air until September. Since I didn’t know if I would ever get the opportunity to board another He-Man show, I put my best effort into this one. The story starts out in the courtyard of the Royal Palace. Prince Adam and Man-At-Arms are sparring with swords and shields. This was based on a stock scene of He-Man fighting Skeletor. Man-At-Arms disarms Adam, a techinique that He-Man uses on the villain Zem later. Sometime after the first season aired, critics, namely Peggy Charron of Action for Children’s Television, objected to violence in children’s programming, especially the use of familiar weapons, like guns and swords. Lou Scheimer had espoused “pro-social” content in Filmation’s programming and was surprised at the criticism. Still, he gave instructions to be careful in the portrayal of weapons in the future. Therefore, a lot less of this kind of action is in the second season of He-Man and She-Ra rarely used her sword as a sword (“Sword to rope, shield, net, blanket, ad nauseum”). 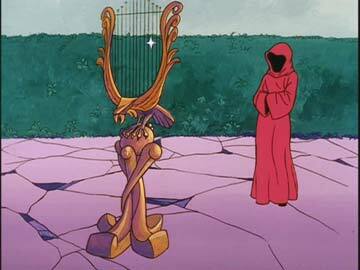 The Sorceress summons Adam and Man-At-Arms to Castle Grayskull. There she replays her mirror video mail of Granamyr inviting He-Man to return to Darksmoke. The old dragon asks a favor of our hero – be a young dragon’s champion for the hand of a human female named Lyra. When I submitted my first draft storyboard, production director Hal Sutherland called me into his office to discuss his revisions. He liked the old dragon and wanted more attitude in the poses. Rather than thumbnail his intentions, Hal demonstrated the poses for me. Now, every time I look at this episode I see Hal with his foot on a file drawer looking cantankerous. Like Granamyr, I preferred my version of Torm, the young dragon, over the final model. I modelled his head after a horse to make him more appealing. Alan Oppenheimer’s Truman Capote voice, though well done, wasn’t what I had in mind either. The model designs also gave both dragons tiny wings which happily for Granamyr were ignored by Layout in the later battle scenes. He-Man agrees to represent Torm in the test demanded by Lyra’s father, Brindle. The story moves to Brindle’s castle where the evil wizard Zem protests Lyra’s engagement to Torm. Zem wants Lyra for himself. She rebuffs him and Brindle orders Zem out of his house. 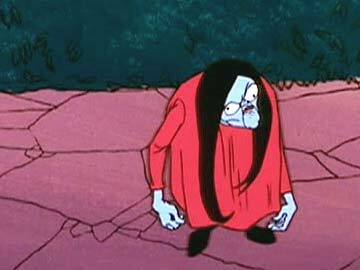 Lou Scheimer gave Zem a weasely voice that sounded like a member of Skeletor’s family. So much so, I thought it was Alan Oppenheimer. Zem storms out of the throne room spewing threats. He pushes past He-Man and Man-At-Arms who just arrived. Brindle welcomes them and Lyra gives He-Man a hug and a kiss for helping Torm. I overdid it a bit when I staged the embrace and thought for certain that Bob Arkwright or Hal Sutherland would veto the extra animation. To my surprise it stayed in. I wonder if the prospective groom would appreciate his fiance cuddling up to his muscular champion. We have not heard the last of Zem, of course. After nightfall, the wizard summons Braylok to take He-Man and Man-At-Arms to the Realm of Demons. Zem wasn’t the only character design recycled from earlier episodes. 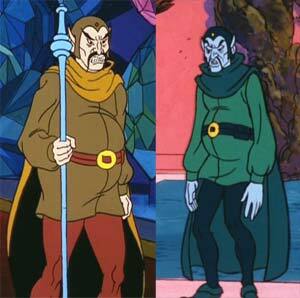 Braylok (on the left) was a much scaled-down version of Aroo, the Guardian of the Masks in “Masks of Power” (MU-66011). By this time in production, budgets were tight and deadlines looming. Anything that could save time and money was considered. When character designs were repurposed, at least the colors were changed to keep some distinction. Little did we know that the fans would be studying the shows and years later cataloging every detail online. Man-At-Arms rolls out of bed just before Braylok blasts it to pieces. Duncan then retrieves his armor to dress for battle. Sometimes, to cut costs, characters are kept in their standard attire for bed which always annoyed me. It’s bad enough that animated characters have no change of clothes, but to sleep in them is ridiculous. I was pleased that my staging of Man-At-Arms, shirtless under the bed covers with no helmet, survived. I placed his armor bedside for identification and so he could reach it after the blast. In my first draft Duncan grabbed 3 articles of his armor which allowed time for him to dress but only the helmet shot was kept. That is enough to indicate he had to get dressed but without the other armor grabs he appears to dress in seconds. He-Man pulls the old pillow-under-the-covers fake-out and jumps Braylok from behind. They struggle and the demon flips He-Man off his back. Man-At-Arms throws a blanket over Braylok who rips it in two. Our heroes duck and the monster sails over them and down a flight of stairs. This battle started out well enough with Braylok blasting Man-At-Arms’ bed and He-man jumping on the demon’s back. The destroyed bed looked good as did the animation of He-Man and Braylok wrestling. Then the action went soft with the blanket bit and ducking instead of fighting. The pressure to tone down the violence had affected the action to the point of wimpiness. Otherwise, Man-At-Arms would have used his gauntlet blasters instead of a blanket. And Braylok tumbling down the stairs was just silly. When our heroes descend to finish the job, Braylok is nowhere to be found. Suddenly, the demon appears behind them paralyzing them with his magical cootie power. Brindle saves them with his magic, banishing the demon back to his realm. Brindle’s test consists of finding the Tree of Many Fruits somewhere in a massive hedge maze and bringing back a single silver apple. Brindle magically seals the maze to prevent interference, but Zem hitchhikes into the maze by turning into a fly and riding on He-Man’s sword scabbard. Inside the maze, Zem flies off and returns to his human form looking for his chance to steal the fruit. To cut down on animation costs but keep the visuals interesting, I staged some complicated camera moves on background art. Scene 137 is He-Man’s POV moving through the maze. The first half of this move was directed exactly how I boarded it. But the second half was too complex and greatly simplified in the final screen version. Instead of zooming out to simulate turning a corner, the camera just pans right to the harp and then pulls back to reveal a hooded figure. This scene may have been simplified for cost reasons or a directoral preference. I learned later that different directors had varied strengths. Some were better at getting good character animation out of the animators and others were adept at planning complicated camera scenes containing multiple levels of background elements. 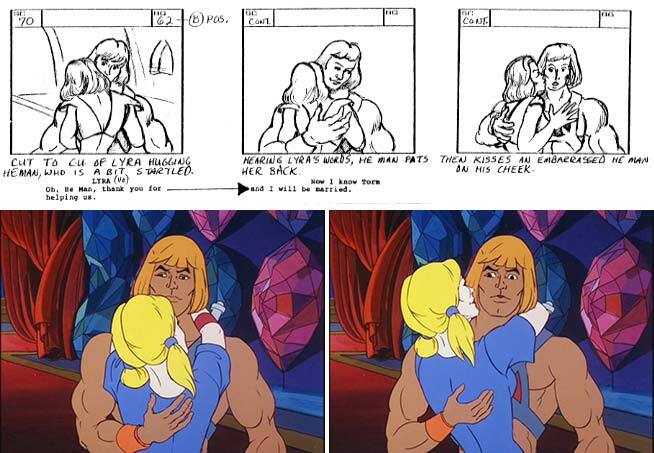 By the 2nd season of He-Man, directors were assigned to episodes earlier in the process and there was more interaction with the storyboard artists. Ideally, a storyboard artist could tailor the staging to a director’s strengths. Also the director would have input on the story’s staging before the board was finalized. This change of workflow happened primarily because Hal Sutherland moved over to the feature unit and did not have direct oversight of the 2nd season shows. The hooded figure asks He-Man what he seeks then removes her cowl to reveal a “Gorgeous Woman” as Larry DiTillio named her. 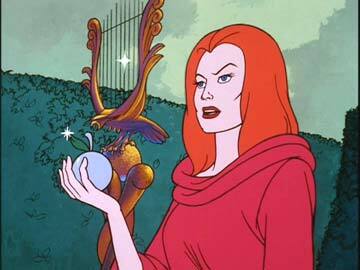 She holds out a silver apple stating He-Man’s quest is ended. (This is a classic temptation of seductive beauty and easy achievement.) But He-Man responds with Brindle’s instruction that the apple would be on the Tree. The temptress suggests Brindle lied or doesn’t He-Man believe what he sees? He-Man rejects GW’s offer and throws his sword at the harp which bursts in a flash of light. The Gorgeous Woman changes into her true form, a dwarvish thing. She praises the champion, points the way to the Tree and vanishes.